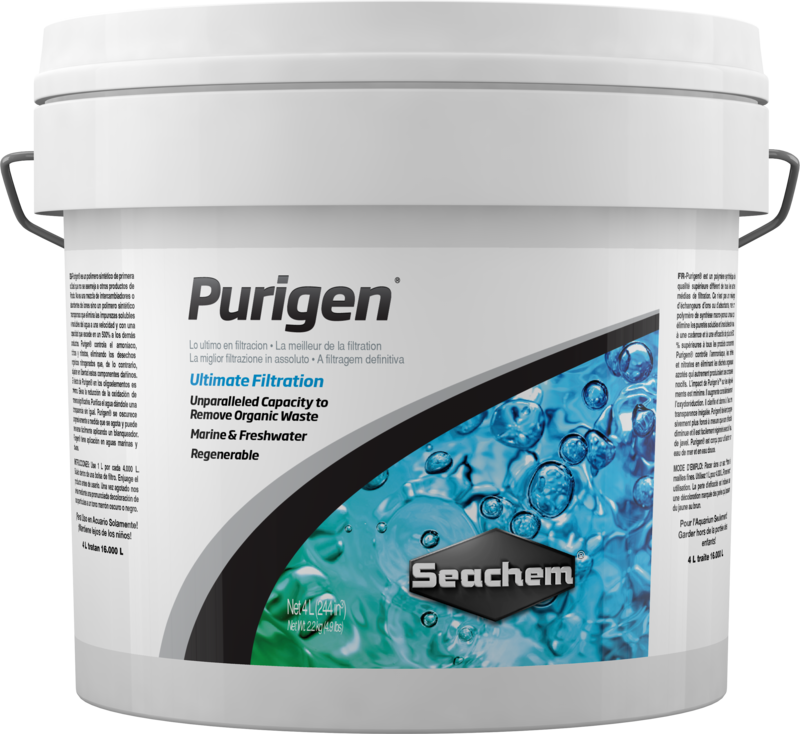 Purigen® removes soluble and insoluble impurities from water at a rate and capacity that exceeds all other competing products by over 500%. 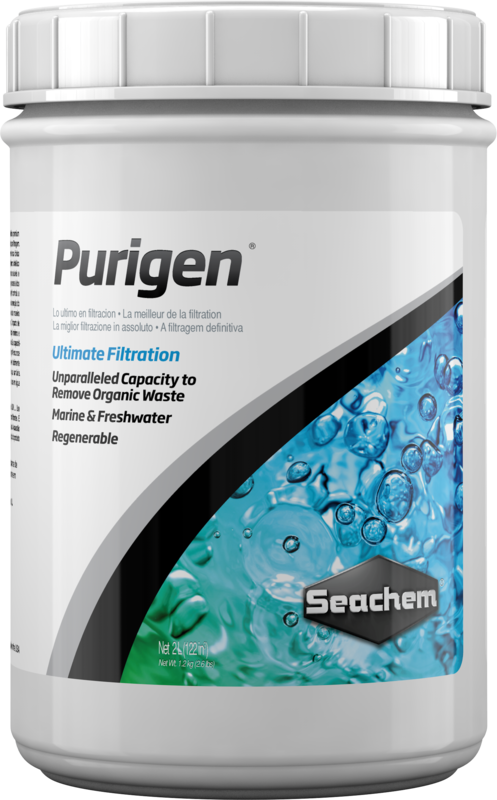 Purigen’s® possesses enhanced capacity owing to its vast surface area. All other resins on the market are purely spherical extruded beads. These beads remain smooth even under a microscope. Purigen® is both spherical and macroreticular. It has microscopic pores that increase its usable surface area to many times that of a purely spherical resin. Rinse before use. Use in a fine mesh (180 micron or less) filter bag such as Seachem’s The Bag™. 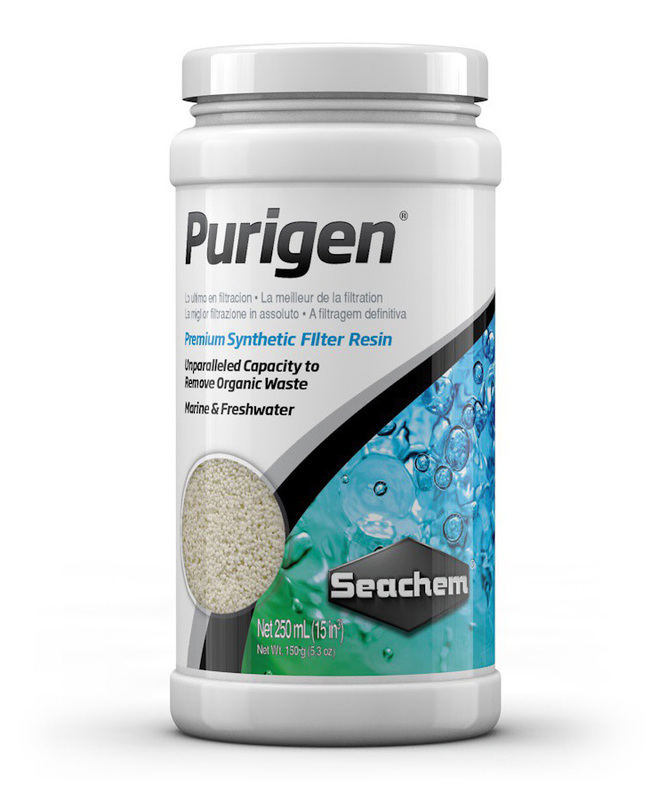 For best results, Purigen® should be placed so as to maximize the flow of water through it. It may be used in a canister filter, media chamber, box filter, or any high flow area of a trickle filter. Each 250 mL treats up to 1,000 L (250 US gallons) for up to six months. Exhaustion is indicated by a pronounced discoloration of the beads to dark brown or black. Soak in a 1:1 bleach:water solution for 24 hours in a non-metallic container in a well ventilated area and away from children. Use regular 8.25% hypochlorite household bleach (non-scented, no dyes, do not use a splash-less bleach). Rinse well, then soak for 8 hours with a solution containing 4 tablespoons of Prime®, or equivalent dechlorinator per cup of water. Rinse well. For freshwater use, soak for 4 hours with a solution containing 2 tablespoons of buffer per cup of water (Discus Buffer®, Neutral Regulator®). Original color and full activity should now be restored and Purigen® is ready for reuse. Caution: some slime coat products may permanently foul Purigen® and render regeneration difficult. Do not reuse if odor of bleach/chlorine is detectable. In case of doubt, soak beads in small quantity of water and test for residual chlorine with a chlorine test kit. I would like to know what type of bleach are the directions referring to for use when regenerating Purigen®? A: The regeneration instructions are specific to using regular 8.25% hypochlorite household bleach (non scented, no dyes). From our research, the dilution of 4 tbsp or Prime for each 1 cup of water volume will successfully neutralize the amount of 8.25% bleach used in the 1:1 ratio. The directions on your package may say to use 2 tbsp of Prime. This was based on what used to be the most commonly sold household bleaches which were 6%. This concentration is not sold anymore. By doubling the Prime dosage, we are accounting for newer 8.25% hypochlorite bleaches while erring heavily on the side of caution. Also, we would not recommend using a splash-less bleach or a 33% more concentrated bleach as these will not be in the proper form or concentration for the regeneration process. We also recommend smelling Purigen® after the regeneration process. If there is a chlorine or bleach smell, repeat the process of soaking in Prime. When is Purigen® exhausted and how do I regenerate it? A: Purigen® will turn from its normal color to a deep brown when it is exhausted. Soak in a 1:1 bleach:water solution for 24 hours in a non-metallic container in a well ventilated area and away from children. Use regular 8.25% hypochlorite household bleach (non-scented, no dyes, do not use a splash-less bleach). Rinse well, then soak for 8 hours with a solution containing 4 tablespoons of Prime® or 16 grams of Safe™ per cup of water. Rinse well. For freshwater use, soak for 4 hours with a solution containing 2 tablespoon of buffer per cup of water (Discus Buffer®, Neutral Regulator®. Original color and full activity should now be restored and Purigen® is ready for reuse. Caution: some slime coat products may permanently foul Purigen® and render regeneration difficult. Do not reuse if odor of bleach/chlorine is detectable. In case of doubt, soak beads in small quantity of water and test for residual chlorine with a chlorine test kit. Will Purigen® reduce GH (general hardness; calcium/magnesium ion levels)? A: No, Purigen® will not impact calcium/magnesium hardness. On some of the Purigen® documentation I have read it says that some slime coat products can contaminate Purigen® and render it toxic. Can you identify these products? A: Only certain slime coat products will cause Purigen® to become toxic; the products that do this are amine based. Prime® and Safe™ are not amine based and so will not cause this problem. If you're curious, what happens is that the amine compounds can strongly bind to the resin, then when they (the amines) come into contact with any chlorine they will form chloramines which are highly toxic. We offer a stress coat product, StressGuard, which is not amine based and so can be used in conjunction with Purigen®. Does AP Stress Coat foul/ruin your Purigen® product? A: If they use an amine based polymer it will not foul the resin but will render it non-regenerable. What amine based polymers will do is bond not just to Purigen® but to any organic scavenging resin as well as any ion exchange resin and when you attempt to regenerate the resin they will then bond with the chlorine to form chloramine which can be released into the aquarium. This is not just an issue with Purigen® but with all resins being sold in the pet trade. The problem only occurs when one attempts to regenerate the resin, there is no problem unless you wish to regenerate the resin you are using. Seachem products do not contain amine based polymers and are safe to be used in conjunction with not only our resins but also with other companies resins. If a product contains EDTA, and since EDTA is amine based, will such products cause the same regeneration issues with Purigen® as occur with amine based slime coat products? A: The type of amine (tertiary, secondary, etc) is immaterial to the issue. It is the specific slime-coat chemical formulation of certain competing slime coat products that causes them to bond to polymer based resin materials in a manner that is highly resistant to oxidative destruction (via chlorine regeneration). If such a slime coat product had no amine as part of its chemical makeup the situation would merely be annoying, however the amine can undergo partial oxidation to a chloramine while still remaining bound to the resin via the slime coat material (likely through non-covalent interactions). It can then be slowly released back into the water through normal chemical breakdown of the slime coat material on the resin over time. Although this phenomena exists with any polymer type resin (not just Purigen) it is particularly acute with Purigen® because Purigen® predominantly and selectively binds and removes amines (whereas other resins indiscriminately bind amines and other chemical groups). So the point is, it happens with all resins, but it happens more with Purigen®. However it is not merely the fact that there is an amine present since Purigen® removes a whole host of organic amine based nitrogenous waste and this is no issue at all since in those cases since those materials are readily oxidized and "burned" off the Purigen®. So, to answer your question, EDTA is not of concern in this situation as its overall structure is quite different from the amine based slime coat products (although we can't say what the differences are exactly since those other products are not ours and are proprietary). What we can say is we have never encountered this phenomena with EDTA based products nor have we encountered anecdotal evidence to suggest otherwise. How should I store my Purigen® when not in use (i.e between regenerations)? A: Purigen® needs to be stored in a small amount of water to keep the media moist. 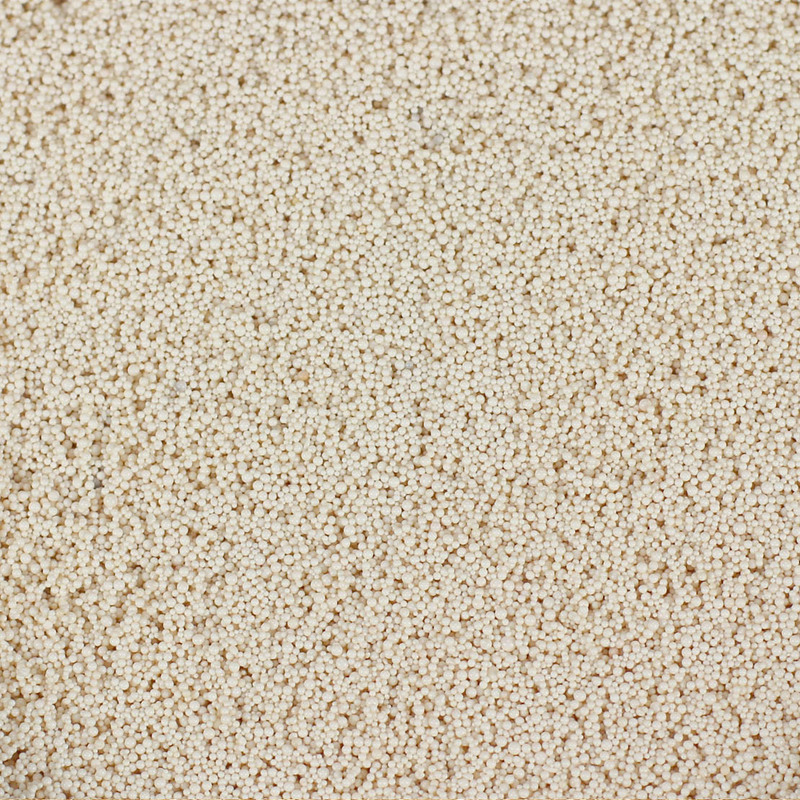 This will prevent the beads from drying out, which can cause them to shrink and crack, reducing the efficacy of the Purigen®. You may use R.O. or D.I water for storing the Purigen® or a small amount of tap (city) water. Any trace amount of chlorine in the tap water will not have an effect on the Purigen® and may keep undesirable bacteria from accumulating in your storage container. 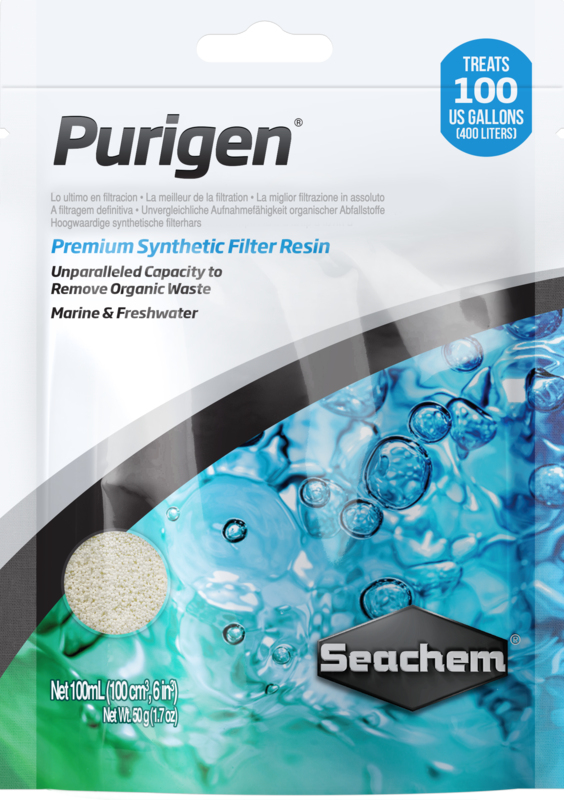 Is Purigen® meant to be a substitute for activated carbon or should it be used with carbon? A: It is superior to carbon in removing organics and not having negative impacts, but it is also compatible with carbon. The use of carbon with Purigen® will extend the useful life of Purigen®. I’m using Purigen® but my nitrate is still high. What’s going wrong? A: Purigen® will remove organics before they can be converted by bacteria into ammonia, nitrite or nitrate, resulting in lowered nitrate concentrations over time, but it will not directly remove these chemicals from the water. If your nitrate is high, we would recommend carrying out a partial water change and utilizing Matrix™ or de❊nitrate™ biomedia to house anaerobic denitrifying bacteria that will remove nitrate from your water.